First, and most important, before you can install and use Form you must first install Connections. Follow this link to the installation instructions. Install CSV Import as you would any other WordPress plugin. Browse to where you downloaded the CSV Import zip file and select it. After you have activated Form, go to the Connections : Settings admin page and click the Licenses tab. Enter the support license key that you received in your email receipt and click the Activate button. With your support license key activated, any time there is an update to Form released, you will be notified in the WordPress admin with an opportunity to update to the latest version with a single click. Select a CSV file and upload. Map the uploaded CSV file column headers to Connections fields. Please take a moment to read both the CSV File Setup Requirements and Tips sections as they contain valuable information that will ensure a successful import. Select the CSV text file and upload. The upload will occur when the “Map” button is clicked. Click the “Choose File” button and select the CSV from your computer that you want to import. 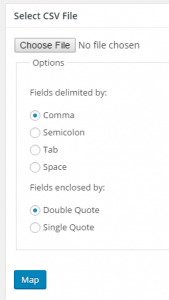 If needed, change the “Field delimited by:” and “Fields enclosed by:” options. In most cases the default values are correct and do not need to be changed. Click the “Map” button to upload the CSV file and to proceed to Step 2. The column on the left are the column headers that were found in the CSV file that was just uploaded. The column on the right are drop downs that contain a list of all the available fields that data can be imported into Connections. For each column select from the drop down the field in Connections the data from the CSV text file should be imported into. You may find that some or all of the drop downs have selections made for you. This is because they were auto mapped based on the column header name of the uploaded CSV text file. For any data in the CSV text file you do not want to be imported change or leave the field drop down set to “Do Not Import”. The CSV text file must have fields for the first name and last name OR organization name and must be mapped to the corresponding fields within Connections, otherwise that row will be skipped when the CSV is being imported. After you have made all your selections, click the Import button. It is highly recommended that you triple check your mapping selections because after clicking the Import button there is no stopping the import process. It is at this point that your CSV file is being imported. Please do not navigate away from this page as doing so will interrupt the importing process and it will not complete. After you have received the “Import Complete!” message it is safe to navigate away from this page. The initial row of the CSV text file must contain the column headers. For example; first name, last name, street, city, state, zip code and so on. The column header names do not need to be specific but should at least be descriptive so you will be able to identify the data contained within the various CSV columns when mapping to the Connections fields. However, if you use field names that are common with CSV text files that are exported from Outlook, Gmail and Thunderbird, Connections will try to auto map those to the Connections fields. If the CSV file being imported is using extended characters such as ä, è, ö and ü the file must be UTF8 encoded. Please see this FAQ for more details. It is highly recommended that the CSV file being imported be created from either Google Sheets or LibreOffice Calc instead of Microsoft Excel. Microsoft Excel uses the current machine’s local configuration for file encoding, field delimitation and field enclosure when exporting a CSV file. This is done in order to be helpful to the user but this can be problematic and cause inconsistent results when importing. You will receive the best results if the CSV file is UTF8 encoded. 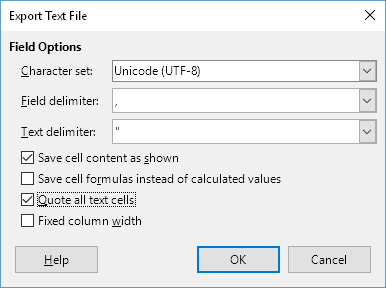 You can easily do this by exporting your CSV file from LibreOffice Calc by selecting the UTF8 file encoding option as shown in this screenshot. In order to see these options, you must select the “Edit filter settings” checkbox in the file Save As dialog box. If a row in the CSV text file has a first and a last name that row would import as an Individual entry type. If a row has only an organization name that row would be imported as an Organization entry type. If the row contains both a first / last name and an organization name the entry would be imported as an Individual entry type. You can explicitly specify the entry type of each row to be imported by adding an “Entry Type” column to the CSV text file and setting each row as either individual or organization. In Step 2 you would map the CSV Entry Type column to the Entry Type field. The imported entries will be set to the “Public” visibility status by default. You can explicitly set the visibility of each row to be imported by adding a “Visibility” column to the CSV text file each row to one of the following; public, private or unlisted. In Step 2 you would map the CSV Visibility column to the Visibility field. Why is nothing being imported? First, please refer to both the CSV File Setup Requirements and the Tips sections in the documentation as following those resolve most issues encountered when attempting to import a CSV file. If you are importing an exported file into a “clean” or “empty” database, do not map the Entry ID when importing. Mapping the Entry ID column tells the CSV Import to update the existing entries. If those entries do not exist, there are skipped, they are not imported as new entries. Extended characters are not being imported. If the CSV file that is being imported contains extended characters such as vowel mutations “ä, ö, ü,” (used in German) are not being imported. The cause could be the the CSV file was exported from Excel. To resolve the issue, open the CSV file in Notepad, click File and then click File Save as. Choose a new name for your CSV file, change the Encoding to UTF-8 and save. Import the newly created CSV file and the extended characters should be imported correctly. I get the following error: ERROR: Incorrect type of file. The issue is that the server is not properly recognizing the CSV file mime type. A solution that seems to always work is to change the file extension from .csv to .txt. How do I import categories? Create a column with a header named ‘Categories’. Under the ‘Categories’ header, each entry can have multiple categories assigned to it. The Categories must be separated by commas. The CSV fields must be enclosed by single or double quotes. Here’s an example of what the category column for a single row should look like in the CSV file. The above would create three new categories, if they did not previously exist, and associate them to the entry being imported. Category hierarchy can not be imported. You must import the categories first. After the import is complete, you can edit the categories to set the parent categories to create the category hierarchy. When editing the categories, the relationships to the entries will be adjusted so no edits will have to be made to them to account for changing the category parents. Alternatively, you can import the categories first, including the hierarchy, first using the Category Import tool which does support bulk importing of nested categories. If you are using a spreadsheet application to create your CSV file, do not add the open/closing quotes. When you save the CSV file from the spreadsheet, the spreadsheet will add the quotes automatically. I get the following error: ERROR: Destination directory can’t be made writeable. You are receiving this error message because the directory can not be automatically created and/or made writable due to the server security permissions configuration. Create a folder named csv_files within wp-content/plugins/connections-csv and set the permissions to either 755 or 767. In some instances you may have to change to the permissions to 777. When you have completed the import you should reset the folder permissions back to 755 if you changed them to 777. NOTE: If the folder already exists, please delete it first.